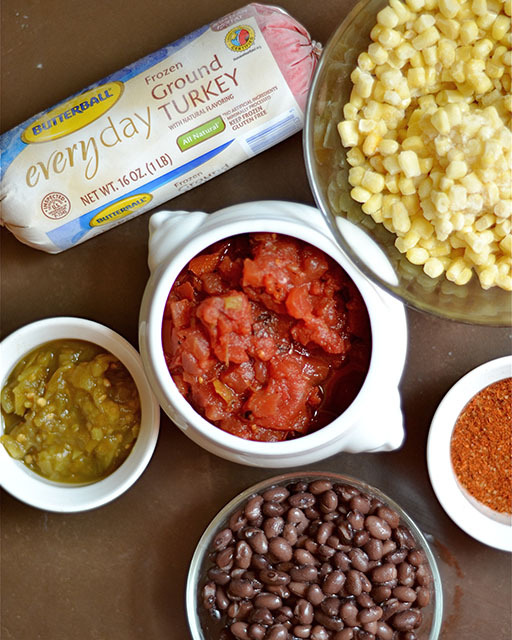 Slow Cooker Southwest Turkey Tacos is the perfect weeknight meal! So easy, delicious, and one the whole family will love! The grind of the fall is just around the corner, and I don’t know about you, but my slow cooker is an absolute must if we’re getting a home cooked dinner on a busy weeknight! The dinner that always gets greeted with the most enthusiasm is Taco Tuesday. My kids are usually so occupied with clearing their plate, that Taco Tuesday is our quietest meal of the week. No complaints or arguing, just a peaceful meal. It’s glorious! I knew that I wanted to try Butterball’s Ground Turkey as a slightly different variation for our tacos. My family of Turketarians were happy to try, and with so much flavor in this dish, we all loved it!! What I also loved, was the super easy prep and cook time. We spent the day at our local amusement park, and came home to dinner just about ready! So convenient for busy families. To begin you’ll gather all of your ingredients. 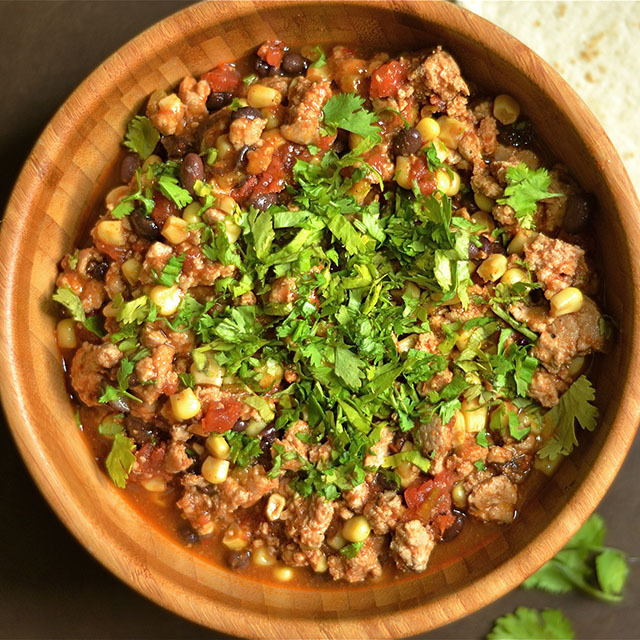 I used Butterball Everyday Ground Turkey, black beans, frozen corn, my favorite taco seasoning, diced green chiles, canned tomatoes, and chicken broth. That’s it!! You will need to brown the turkey for just a few minutes before tossing into the slow cooker. Combine the remaining ingredients, and set on low for 5 hours. Bonus: your house will smell amazing!! You can do so much with this versatile dish. I actually had a taco bowl and topped with cheese, cilantro, and avocado. My kids and husband wanted to wrap the ingredients in a tortilla. You can enjoy as ingredients to a salad (which I did the following day for lunch), or even enjoy like a soup or chili! I will also give you something else to love: we had plenty for leftovers the next day. Anytime a meal is so easy and takes care of dinner for two nights, it’s most definitely a winner! Begin by browning your ground turkey in your slow cooker (if possible), or in a skillet on the stove. 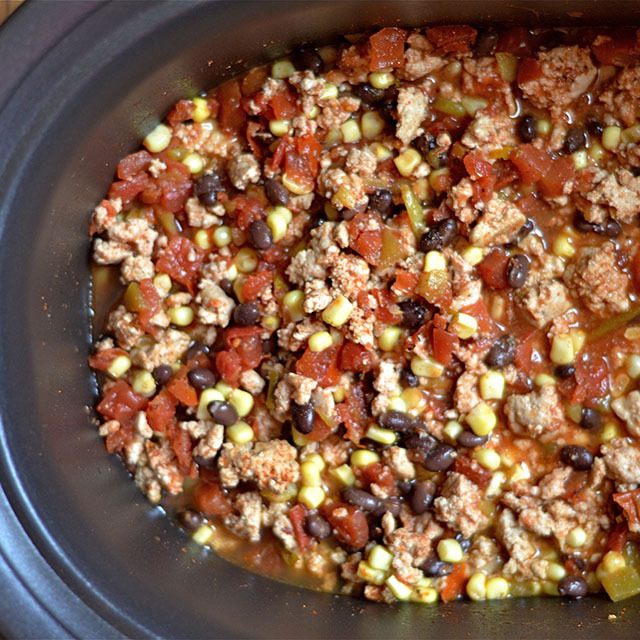 Place ground turkey at the bottom of your slow cooker. 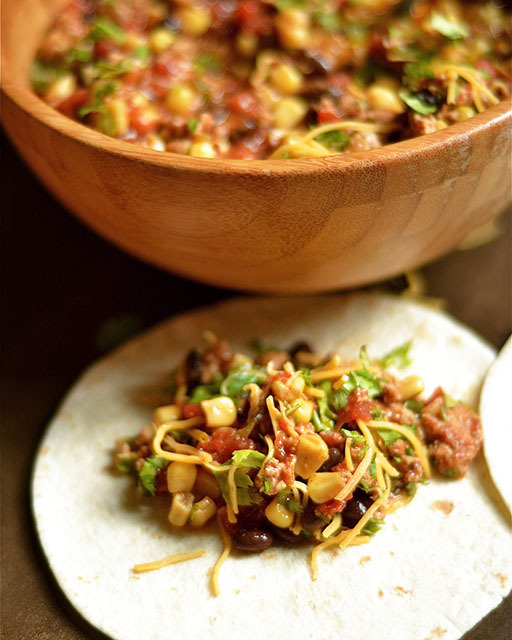 Top with taco seasoning, tomatoes, frozen corn, drained black beans, and diced green chiles. Top the entire pot with chicken broth. Set your slow cooker to low and cook for 5 hours. Serve immediately and garnish with your favorite toppings.